Eva (Tilda Swinton) is a free spirit. She travels the world with abandon joining in with all that global culture has to offer. She meets Franklin (John C. Reilly), falls in love, and becomes pregnant. Instantly she feels trapped and uneasy with the changes that are taking place both within her body and in her lifestyle. Matters only get worse when her baby, Kevin, is born. She finds herself unable to meet his needs despite going through the paces of what is expected of motherhood. Meanwhile, Franklin is oblivious to her struggle and, worse still, appears to undermine her difficulties. Having failed to bond with Kevin, Eva continues to struggle with her role of mother as he grows up. She feels exasperated, resentful and unsupported. She grieves the pre-Kevin life that she has left behind. Kevin is a challenging and increasingly disturbed boy who resists Eva at every turn. He pushes her to the limits of her patience - and beyond. Was Kevin born evil? Has his mother's actions turned him into what he is? Who is to blame for the horror to come? I read Lionel Shriver’s upsetting novel, We Need To Talk About Kevin, when it was first published. I hadn’t read anything about the story beforehand and I certainly didn’t know about the horrific end. I think I was in a state of shock for weeks. The novel is structured as a series of letters and, as a result, I was interested to see how director, Lynne Ramsay, would approach the film version. Ramsay translates the plot from novel to movie perfectly. Instead of letters, she uses audio phone messages (as well as flashbacks) to tell her story. When I first watched this film, I had to mentally steel myself for the nightmare that I knew was to come. But I do remember thinking that nothing could come close to the unsettling experience of the book. However, I was so wrong. This is perhaps the best book adaptation I have ever seen. It manages to achieve the perfect tone of grief and dread. Tilda Swinton is superb as Eva - I can’t imagine who else could have possibly played this role. Ezra Miller is so disturbing as Kevin - again another brilliant casting choice. The film, much like the novel, does not seek to apportion blame. It does not suggest that Kevin is inherently evil. It shows us the mistakes that Eva makes and also the ways in which she tries to improve her relationship with her son. Ramsay is so clever in the way that she unsettles your emotions. She portrays Eva’s early motherhood experiences so well - and you feel for her as she becomes emotionally and physically exhausted. Just when you think that it is all down to Kevin and that he was a disturbed child from birth, the film shows you a shot of Eva holding Kevin while he is crying. She holds him at arm's length and his distress makes you desperate for her to draw him into her body and give him the comfort that he needs. It is then that you feel it is Eva’s withdrawal from her son and the anger that he feels as a result, that causes him to do act out in the way that he does at the end. There are no easy answers in this film - indeed there are no answers at all. It is all so incredibly upsetting - much in the same way as the novel. This is not a movie that you enjoy - it is something that you experience. The film takes you on a dark journey and it never lets you go and it never loses its way. We Need To Talk About Kevin is, quite simply, a phenomenal film. 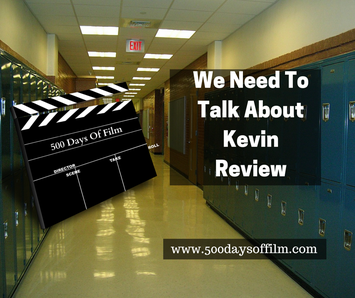 Despite its chilling story, We Need To Talk About Kevin feels like a perfect film to me. The BBFC found this film an interesting one to classify. There is a lot of swearing and one instance of very strong language. However, the context of this and other shocking scenes was within the limits of a 15 rating. I get chills even watching the trailer for this film.